The active sensing of ice-sheets from space with radar satellites offers the possibility to monitor the ice surface year round, day and night. Coherent radar systems allow to increase the spatial resolution significantly via a phase sensitive post-processing. This processing “artificially” increases the antenna length and creates a “synthetic aperture radar (SAR)”. The SAR images preserve amplitude and phase information in each pixel. In an interferometric processing step, two SAR scenes imaging the same area from slightly different view-angles and at different times are subtracted. A color-coded representation of the phase difference is an interferogramm. Over ice sheets, the phase difference is related to the surface topography and displacement. Both contributions can be separated in a differential approach (under the assumption of constant surface velocities) by the subtraction of two interferogramms. This enables the area-wide derivation of topographical maps and flow fields. 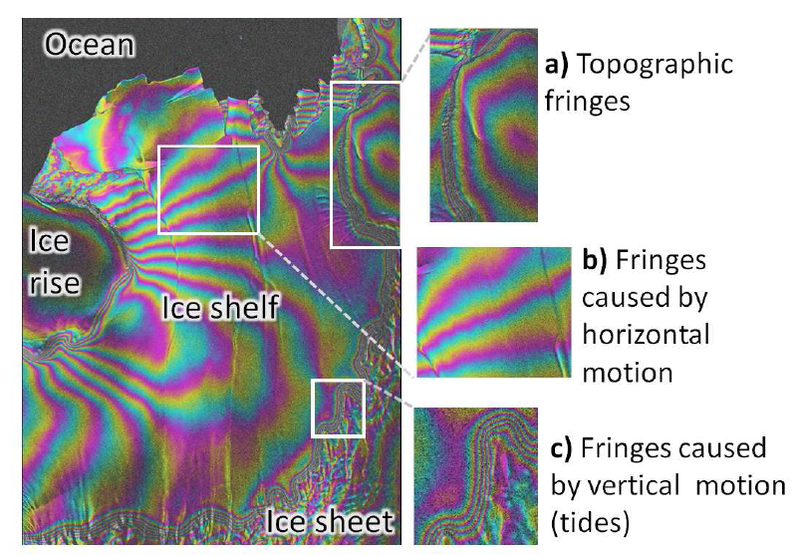 Interferogramm showing fringes induced by topography, ice-flow and tides. Image: S. Berger.